In among my attempts to build a Halloween costume, allow me to blog a while. Over the last two years I’ve been lucky enough to have been digging holes over the gardens at Edwins Hall in Woodham Ferrers. 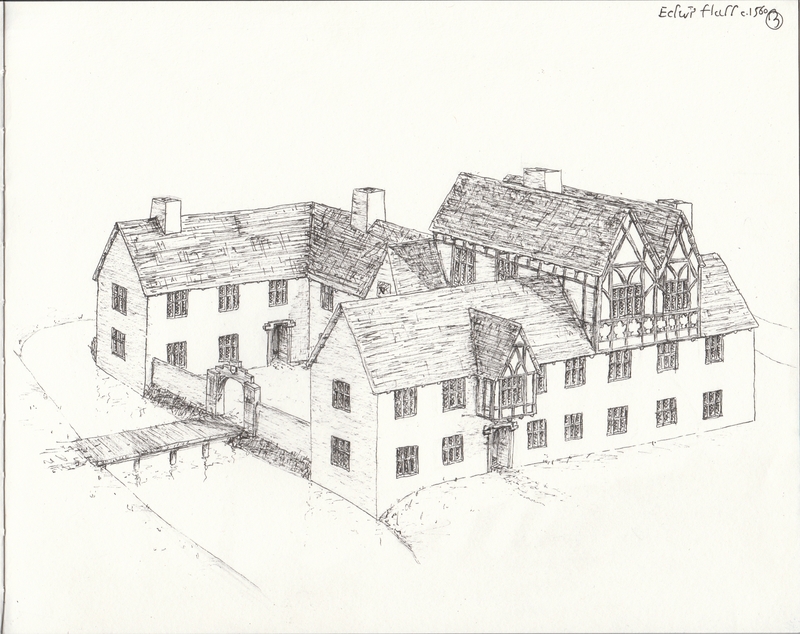 A few years ago I was involved in a dig to locate the back end of a lost Tudor wing before the area was built over, and these last two seasons we were kindly invited back to investigate a lawn in front of the house – searching for more of the lost Tudor wings. 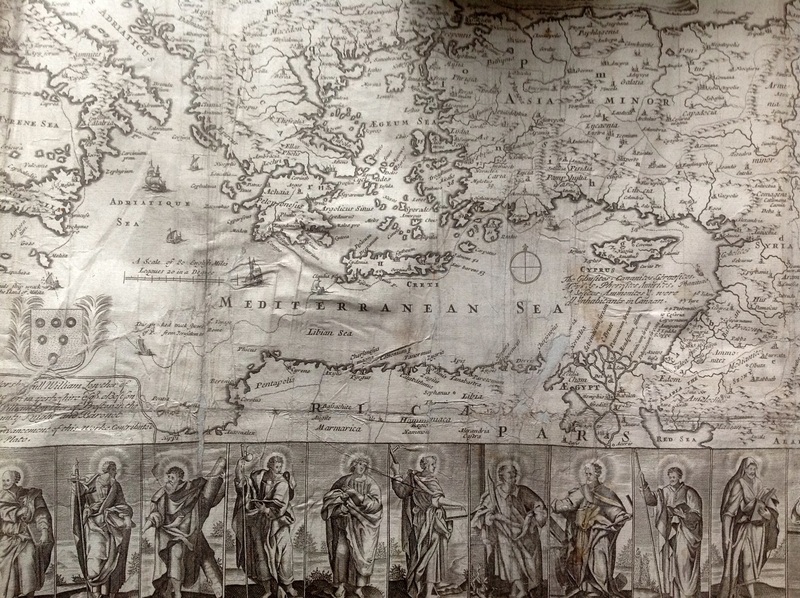 A few years ago now I bought a battered old book printed in the late 17th century and entitled as a History of the Bible, covered in writing from several ancient owners and – a pleasant surprise when it arrived in the post – full to the brim with over 200 engravings and maps. 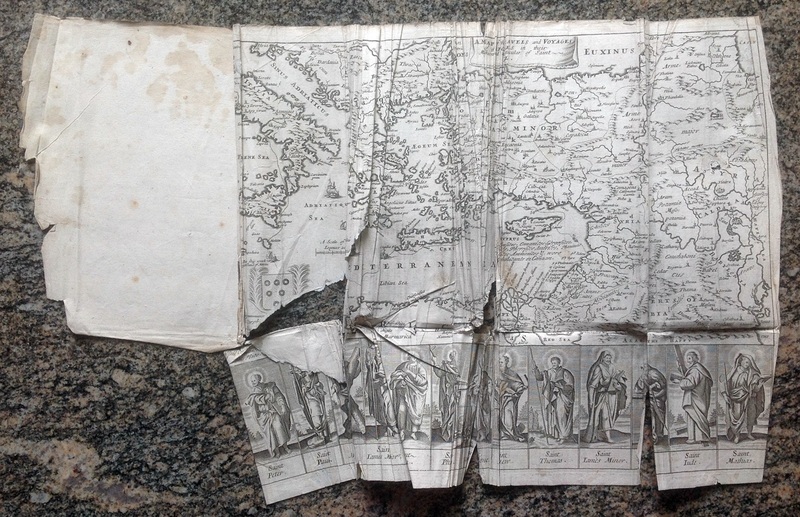 The remains of the binding are the original paneled calf, and I’m yet to start on restoring that, but I have been busy restoring several of its pages and engravings – and one of the large maps – within the book, so allow me to blog upon it for a while! 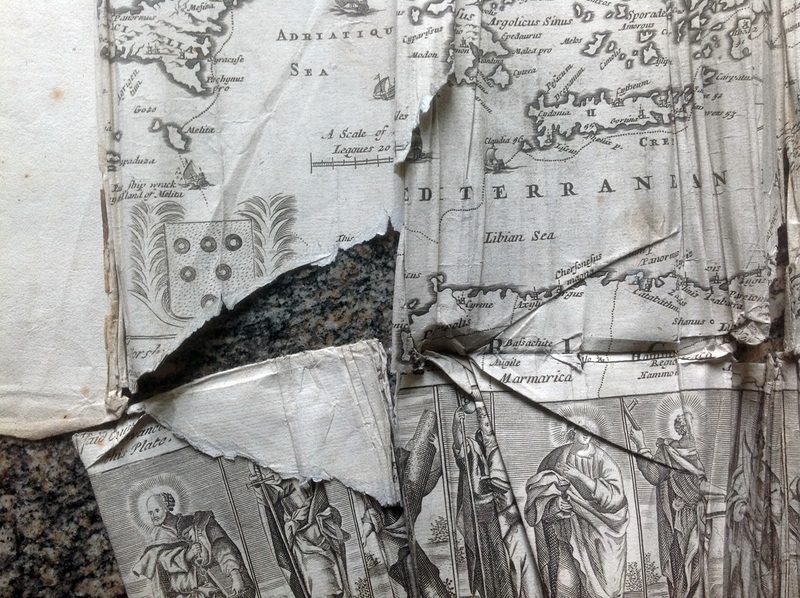 The map was completely ruined – It had been sat loosely in the front of the book for a very long time. It was folded and tattered, with tears and holes, and much of the paper beginning to feel very delicate indeed. About a week of pressing, washing, and carefully repairing the map it was together one more. Some of the paper was stretched enough that it wouldn’t lie completely flat even after the work was done on it, although most of it tied together neatly. While restoring the plates, though, I discovered that of the few that were loose from the binding the fault did not lie with age and decay! In fact, about six of the plates had never been sewn in, just put in place and then perhaps forgotten about by the binder. After some reflection upon it, I decided that it was safest for the purpose of keeping the plates with the binding that they should at last be sewn in – I have far too many books were unkind hands have taken out the plates for framing, and I had no desire to make this temptation even easier. 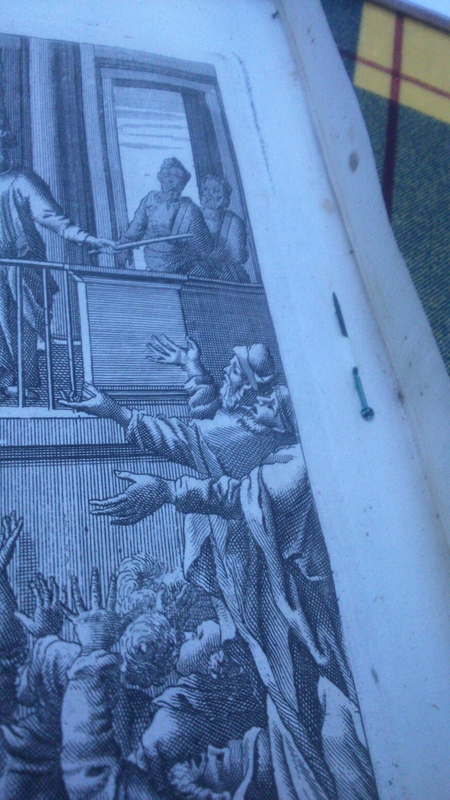 It was a little seventeenth century pin that had at one time pinned the page in place – perhaps the work of the original bookbinder himself, holding the engraving in place for sewing but for some reason never finishing his task! Until next time, Dearest Reader! Tl;dr – I read a good poem. Nle;wm (not long enough; write more) – you are fortunate indeed, for I have – and I hope, fond Reader, that you enjoy! A book I rebound last year is a rather fine history of the antiquities of Westminster, produced by the worthy Jodocus Crull – a man obscure enough that even the factual guesswork of Wikipedia admits “his life remains somewhat of a mystery“. However, mysterious though Crull may have been, a small insert at the end of the book is a well printed poem upon the same subject as the book itself, introduced as On the Tombs in Westminster by Francis Beaumont, gent, written in 1658. It was such an excellent poem that I did some research and discovered Beaumont to be a famous Jacobean playwright, and by the most kind luck I went to see one of his plays at the Globe. Having enjoyed that too, I was perplexed and slightly disappointed to find that the Francis Beaumont who wrote that play died in March 1616, some 42 years before Crull says that On the Tombs in Westminster was written. Of course, there are several possibilities for this – Crull could simply have been mistaken and noted the date down wrong, or the typesetter who made up the book could have used the wrong numbers by mistake – It does occur, surprisingly! However, in the several editions that appear the date does not change – suggesting subsequent printers agreed with the original interpretation of the date. The work itself is notable even perhaps for the quality of type within in, and indeed a lack of errors, suggesting it was well checked before printing. Also, Crull’s accuracy in the rest of the work when referring to dates and deeds is exemplary, and he is unlikely to let the whole thing slide with a wildly out of place date on the last page – especially one that to Crull’s eye would have been recent. Could it possibly be, then, that this poem ascribed to Francis Beaumont the playwright for at least 200 years could in fact be by another hand? It was an exciting proposal, I’ve had my go at theorising about Shakespeare and I was intrigued to get to the bottom of this particular new mystery. Alas, however! Miserably discovered Reader! I found quickly that there is no Francis Beaumont who even comes close to fitting a figure who could have been writing a poem in 1658 and been notable enough to have it published 50 years later. I suspect therefore two possibilities – and I will deconstruct the work too a little having presented it – but firstly, these are my suggestions upon this work’s author: either, there was some unknown Francis Beaumont, who through some kind luck wrote a poem years before on the same subject that Crull would later write about too. Either through a friend, a meeting, or perhaps discovered in the archives of the abbey when Crull was doing his research, the poem came to light and was pleasant enough for Crull to present it in his book. I think it more likely, however, that the Beaumont of the poem used a pseudonym – making his real identity near impossible to prove – but may mean the poem was by Crull or one of his friends, who for whatever reason wishing to remain and anonymous poet, published the poem under the name of perhaps a favourite playwright, with an invented date alongside. I will, should this blog have lingered for near long enough, weary Reader, now present the work that inspired all this. The poem is arranged in a simple aabbccdd rhyming pattern, although interestingly the latter three couplets of the first verse have one of the rhyming words repeated in the respective couplet in the latter three couplets of the second verse. That particular trait of the poem makes it, as far as I know, unique and, whether by chance or by design, has brought me no closer to finding it’s creator. And now it is midnight, and I am still on a train. Farewell, kindest reader!